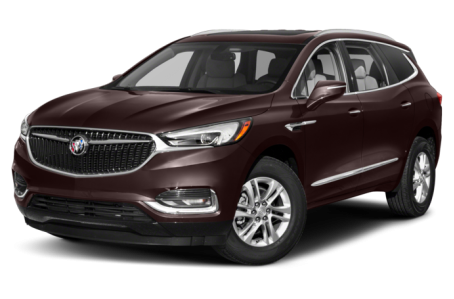 The 2019 Buick Enclave is a mid-size SUV that seats seven passengers across three rows. Maximum cargo capacity is 97.6 cubic feet with the rear seats folded down. Four trims are available: the base model, Essence, Premium, and Avenir. All trims are powered by the same 310-hp, 3.6-liter V-6 engine mated to a nine-speed automatic transmission. Front-wheel drive (FWD) comes standard, while all-wheel drive (AWD) is optional. Fuel economy for the FWD Enclave is an EPA-estimated rating of 18/26 mpg city/highway. It slightly decreases to a 17/25 mpg rating for the AWD models.